You know those students who think teachers live in their classrooms? They’re not entirely wrong. Sometimes it feels like we do! The average teacher spends a minimum of forty hours in their classrooms each week. And, we know, for many of us, this number is even higher. Our classrooms truly become our second homes. It’s vital to make our classrooms places we enjoy spending time. But how can we do that when the room doesn’t truly belong to us? Check out these 5 things you can do to make your classroom a happy space. How amazing would it be if every art teacher could design their classroom to their exact specifications? Unfortunately, for the vast majority of us, this dream will never be realized. However, for your well-being, it’s important for you to enjoy your space. 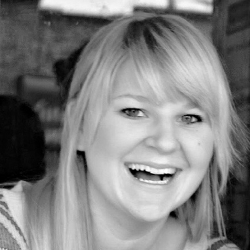 Research shows productivity and engagement increase when we are happy with our physical setting. Think about how you feel when you enter your classroom. Do you feel energized and excited? Or, do you feel like you are walking into a sterile, institutionalized space? If you relate more to the latter, consider making some changes. The first step is to embrace the things you cannot change. For example, if you aren’t allowed to paint, you might not be able to change your dull cabinets or sterile white walls. But, could you come up with a creative non-permanent solution? Here are 4 ideas to help make your classroom feel a little bit more like home. Create a temporary tape mural. Buy an area rug to add some color. Paint a desk chair to fit your style. Transform your cabinets into a work of art. In a perfect world, our desk or workspace would never get messy. But, after digging through hundreds of “organized” piles, you may need to admit you have a problem. Starting your day with a clean workspace will make you happier. We’re only human, so it’s not going to happen every day. From here on out, challenge yourself to start your week with a clean desk. Your future self will thank you. 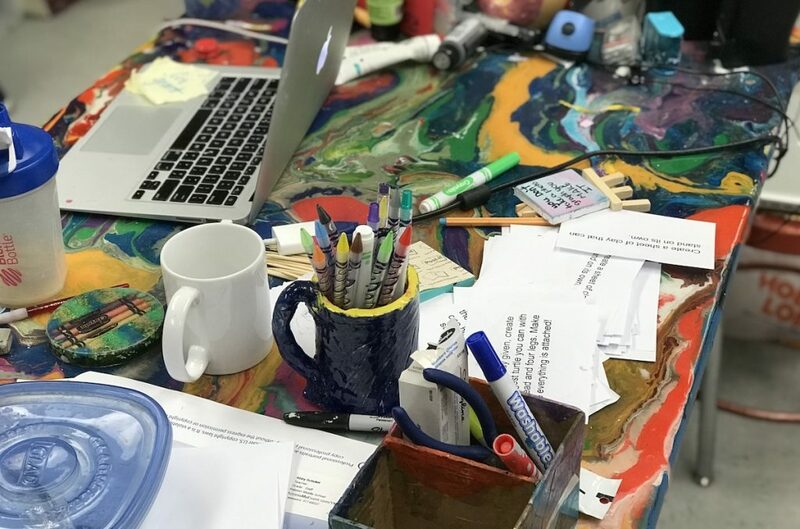 Do you have a space in your classroom you avoid because the clutter is haunting you? Maybe it’s a back closet that still isn’t cleaned out from the previous art teacher or totes of donated materials you know you’ll never use. It’s time to put on your game face, stop avoiding it, and tackle the mess. If you want your classroom space to feel like a pleasant place, there can’t be areas of avoidance. Start simple by tidying up small areas one at a time. If you need more encouragement, participate in the 30 Day Minimalism Challenge for the art room. Did you know that the color green can have a positive influence on your creativity? Green is associated with nature, so you need a few classroom plants! Research has even shown individuals who sit near live foliage perform better on creative tasks. This means plants will be beneficial for both you and your students. 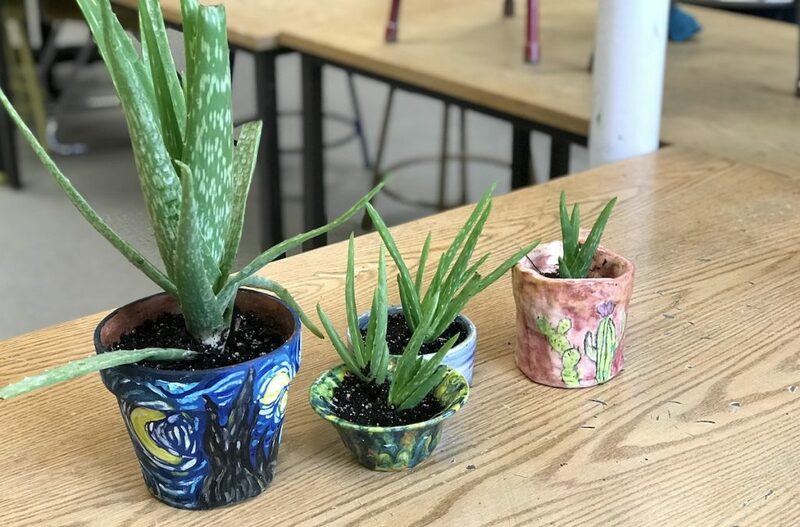 You don’t have to be a master gardener to keep a few indoor plants alive, but if you weren’t blessed with a green thumb, try one of these for your classroom. Spaces with natural light make us feel happier, more alive, and vibrant. If you’ve ever worked in a classroom without a window, you know the pain of light deprivation. 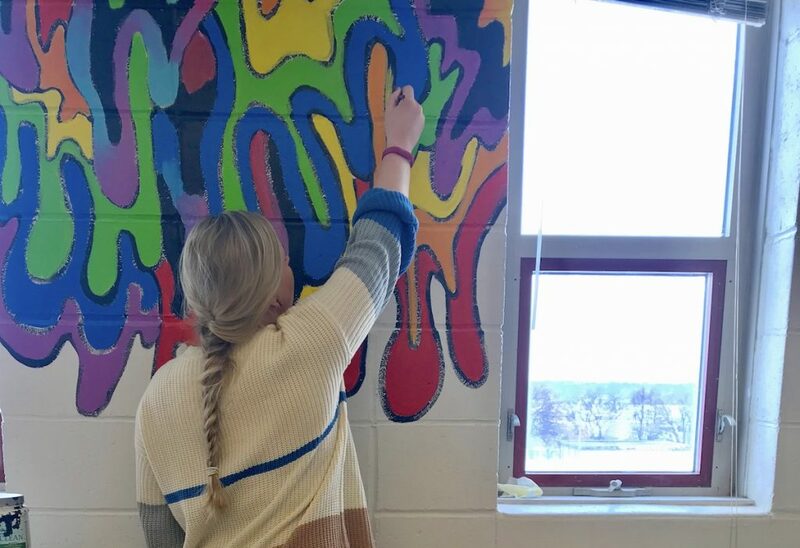 Not only is it good for our well-being, having access to natural light can add tremendously to several instructional purposes in the art room. If you don’t have a window in your classroom try brightening it up with the following ideas. Request for your classroom walls to be painted a lighter color like lavender or light green. Swap out your fluorescent light bulbs for daylight bulbs. Add a mirror to reflect more light and create the illusion of more depth in your classroom. 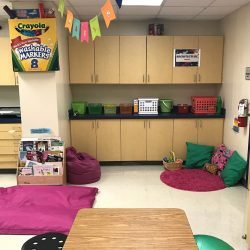 As you step foot in your classroom, it’s important for it to feel like a happy, inviting space. 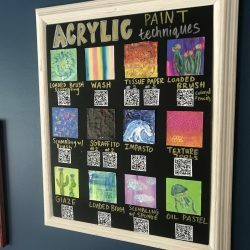 How one art teacher decorates their art room will not be the same for another, and that’s fine. What is important is that you are creating a space where both you and your students will be happy. How do you make your classroom feel warm and inviting? What’s one thing in your classroom that makes you happy? 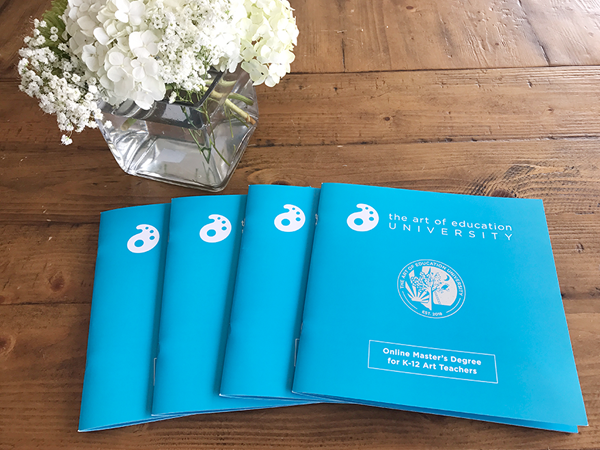 In short make your classroom a perfect example of your craft skills. How do make a graphic arts classroom look exciting? any suggestions? “Art with Mrs. E” just created some beautiful graphic portraits of famous artists. Maybe you could get these and frame them in a nice way, or have your students create something bright and inspiring of their own to display! COLOR! Spruce up your informative resources in your classroom. Adding a simple colorful banner or garland can make an area come alive. I’m all for this! I have 2 classrooms and have designed and decorated them so that they are places that spark creativity for my students and bring me joy! Things like painting my walls, recovering chairs with nice fabric, new rugs, coordinated color schemes, pillows, etc. I love coming to work everyday in my spaces. That’s awesome, it’s so important to love the space you work in!